The U.S. Bureau of Labor Statistics recently released a new set of alternative unemployment measures for four quarters through September 2013, and Idaho posted the largest percentage improvement for the U-1 unemployment rate. This measure includes those who are unemployed for 15 weeks or more. Only four other states posted double-digit declines but Idaho’s 13 percent decrease was the largest. Idaho’s U-1 unemployment rate decreased by four-tenths of a point – falling from 3.1 percent for the year ending in June 2013 to 2.7 percent in the year ending in September. Over the year Idaho’s U-1 unemployment rate decreased by 29 percent – only Hawaii showed greater improvement – declining by 31 percent. At 2.7 percent, Idaho’s U-1 unemployment rate was the 14th lowest among the 50 states and the District of Columbia. Oil rich North Dakota posted the lowest U-1 rate at 1 percent while the District of Columbia was the highest at 5.7 percent. Idaho still had 20,400 unemployed workers seeking employment for at least 15 weeks, down from 29,300 a year ago. In addition to the improvement in the U-1 rate, the U-6 rate that measures not only official unemployment but also discouraged, marginally attached and involuntary part-time workers, is the only other measure to show improvement between June and September. All six rate categories showed improvement over year-earlier levels. Idaho’s U-2 unemployment rate – the rate of people who lost jobs or completed temporary jobs – was unchanged from June to September at 3.1 percent. In the most recent period, the U-3 rate – the official unemployment rate – increased 1.5 percent to 6.9 percent. Oklahoma was the only other state to show a larger increase – 1.9 percent – Ohio and Arizona also saw an increase. The U-4 unemployment rate includes discouraged workers who have not looked for work in the last four weeks because of a grim outlook on jobs available to them. With the addition of discouraged workers the U-4 rate increased by 0.3 percentage points to 7.2 percent. Idaho had 3,000 discouraged workers in the four-quarter period through September 2013 – only 500 shy of the recession high. Discouraged workers made up 5.7 percent of the total 52,800 unemployed during that period compared to only 4.1 percent a year earlier. The number of discouraged workers has not reached 3,000 since the four quarters through March 2012. An uptick in the number of discouraged workers could artificially improve official unemployment rates since discouraged workers are not included in the official count of unemployed who actively seek work. But if the number of discouraged workers continues to increase, it could call into question the resilience of the current recovery. The transition from U-4 to U-5 is subtle – adding marginally attached workers to the total. Marginally attached workers are similar to discouraged workers except they have not looked for work in the last four weeks regardless of the reason. From the year ending in June to the year ending in September, Idaho’s U-5 unemployment rate increased by 1.3 percent – reaching 8.1 percent. Only Ohio and Alaska showed larger increases. The U-6 unemployment rate pulls in part-time workers who want full-time jobs. At 13.2 percent, the U-6 rate is nearly double the official U-3 unemployment rate. An estimated 39,400 involuntary part-time workers made up 5.5 percent of total employment during the four-quarter moving average through September 2013. The current number of involuntary part-time workers is down 25 percent from the recession high which occurred in 2009. 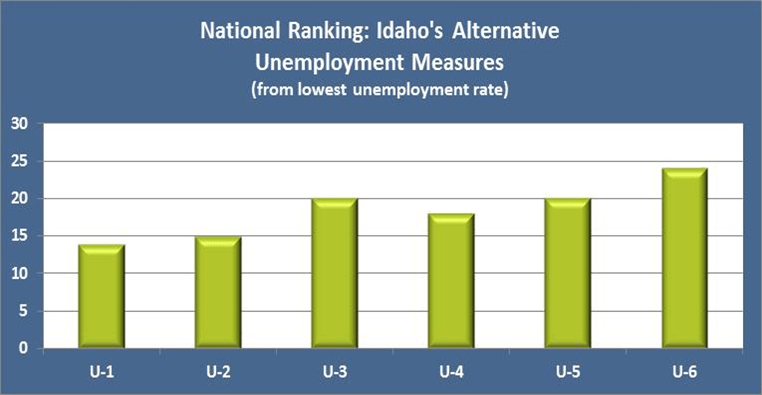 Looking across all six alternative measures of unemployment, Idaho loses ground to the other states with rankings ranging from a low of 14th for U-1 to 24th for U-6. 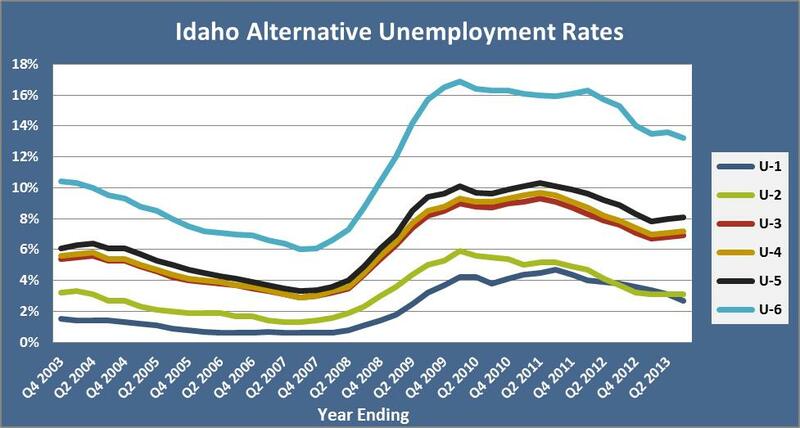 This trend indicates Idaho’s comparative labor market conditions worsen as the definition of unemployment broadens. These numbers illuminate the less publicized pockets of labor market conditions that thousands of Idahoans experience. This entry was posted in Employers, Employment News and tagged Bureau of Labor Statistics, idaho department of labor, unemployment, unemployment rate on December 9, 2013 by Idaho Department of Labor.